With the youngest member of the Alaska contingent approaching 11 years old, there is always a need for ways to burn off energy. He decided we should go for a hike, and chose the location. In the process, we found a spectacular boondocking site, complete with a view of Usery Park's Wind Cave in the background. The site had a clear view of the Superstition Mountains and Lost Dutchman State Park 10 miles to the east. It had a great view of Red Mountain to the north-northwest. If you could see through Red Mountain, you would have been able to see McDowell Mountain Park another 20 or so miles beyond. On a clear day you can see forever. On this day, we were lucky to see 25 miles west to downtown Phoenix. And just in case you need some help with orientation, you can see the Phoenix arrow from World War II flight training days. To make it even better, it's only 1/2 mile to the dump station at the neighborhood Chevron and grocery store. there's a gate at the bottom of the hill. At one time, the hill was home to some microwave towers. It is now privately owned and platted for several home sites although for the past fifteen years it has only been used by people looking for a bit of exercise and a view. Seems like a great spot, IF you could get permission and could get there! For more appropriate information regarding finding boondocking sites, check out Nina's recent post at Wheeling It. Back in December, BJ and I took a hike to some petroglyphs near the Stewart Mountain Dam. While we were on that hike, we spotted a group of people riding horses on the other side of the river, and commented about it. With the Alaska contingent in town, a horseback ride was in order. Our daughter took the day off to join us so we had the whole clan except for the son-in-law who was working. 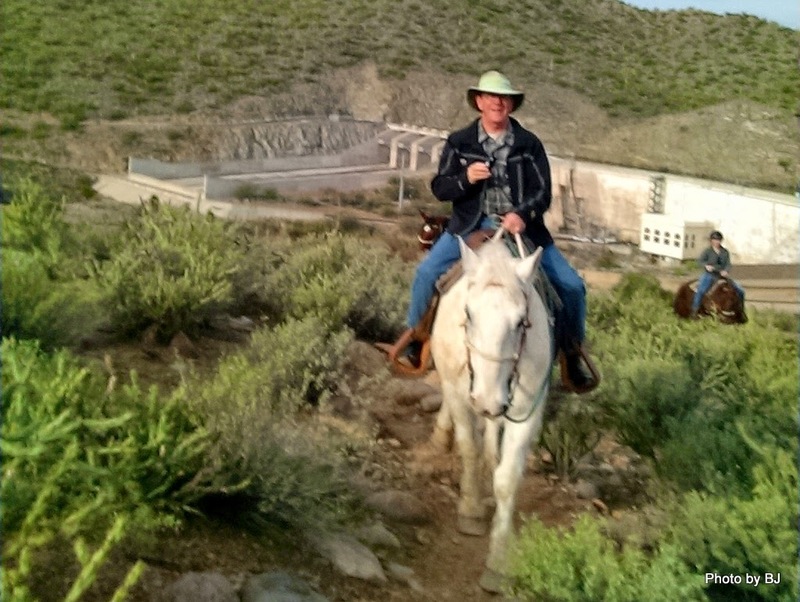 The ride started from the stables at Saguaro Lake Ranch and immediately crossed the Salt River below the dam. The wrangler put the grandson in line immediately behind him, and our daughter and daughter-in-law in the back. I'm not sure if there was significance to the order. We couldn't decide if he was wanted to separate mother and son or if Carleta's horse was the clean-up hitter. Along the way we saw something I'd never noticed before - a tree full of great blue heron nests. It's a terrible picture, but the nest near the center of the picture has a heron standing on the edge of the nest. which means I can prove that I was there as well. We looped up past the dam and over the ridge to get a view of Saguaro Lake. Only a couple boats on the water today. In just an hour we were crossing back over the Salt River to the stables. Not long, but long enough that we all had a bit of a transition back to our own legs. As Spencer put it, "I feel short now." I arrived in Quartzsite in the afternoon. The trailer had been outside for 4 days with no electrical load except for the 3.1 watts the refrigerator draws when the gas is flowing. I reset the meter totalizer when camp was set up in Quartzsite. I then took readings each morning before sunrise to make sure panel output wasn’t influencing the readings. Each morning I would use the heater enough to bring the temperatures up to the lower 60’s and then shut it off, letting the battery recover for 5 minutes before taking the readings. I’m super pleased with how things turned out. Since we already had the trailer equipped with a step ladder, tilting the panel is easy enough, and doesn’t require the ladder to be moved around to reach the hand knobs. The panel keeps up with our demands nicely, even though I never cleaned it after installation and it quickly showed some dusty spots as a result. Should have done this mod years ago! I used the computer all day with it plugged in, expressly to try to create more load. The overnight temps got down to 39 degrees so I used the heater for well over 45 minutes before the morning reading. The Bureau of Land Management (BLM) has designated 6 large tracts of land in the Quartzsite desert for dispersed camping. Five areas are free, and limited to 14 days in a 28 day period. One 11,400 acre area (La Posa) spans both sides of the highway and is divided into four sections. La Posa is designated for long term camping where you can stay from September 15th to April 15th for $180 or for up to 14 days for $40. There are some restrooms, water sources, and dump stations located in the long term area. I chose to stay in the Road Runner 14 day area because it wasn’t as crowded as the areas closer to town. There were areas where folks had clustered tightly, often friends with common interests. I was fortunate to get a spot that was somewhat separated from these busy groups. I did take some time to visit a couple other areas. This is the view from the Scadden Wash area with the big tent in the center of the frame and some of the La Posa area near it. It looks a bit more packed than reality since I used a long telephoto lens for this picture. I did visit the big tent first thing one morning. It opens at 9 a.m. and I was there 15 minutes early to get convenient parking which meant standing in line with 50 other people for the doors to open. I managed to tour the whole tent in less than an hour and left with all the money I came with, although from the conversations it sounded like most approached the show with a “black Friday” perspective. This view is from the north freeway overpass, looking south. I drove out to the Dome Rock area and found a tight conclave of fiberglass eggs getting a head start on the Gathering scheduled for the first weekend in February. No pictures of them, but I did stop for a picture of my favorite version of the iconic Greyhound. We’ll be back for the Gathering, but first a week at home and a couple minor trailer maintenance items. Q’s been interesting, and provides lots of opportunity for people watching. I had great fun comparing solar system notes with BJ's cousin and visiting with friends. It would have been nice to stick around a couple more days for a Blogger's gathering, but family was coming to town. With a short day ahead of us, I wasn’t in any hurry. Even so, I was on the water by 9 a.m., ahead of all but one paddler who departed well ahead of me. I found a rhythm, and enjoyed paddling along the edges of the river, watching the ducks duck into the rushes when they would see me. It didn’t take long to cover the 7.5 miles to Picacho Main where I was surprised to see a river gauge that I don’t remember from past trips. It does make it easy to mark the inlet to the group camp sites. The narrow channel to the Park Ranger’s boat launch and the group camp sites is immediately downstream of the bulkhead in the prior picture. It’s a very narrow entrance and can be easily missed if a person isn’t watching. Picacho State Recreation Area is road accessible (18 miles of washboard dirt) and has 54 individual sites in the main camping area. It has water, and an RV dump, but it’s real claim to fame for paddlers is that it has solar heated showers! The group camp site for boaters was large enough that I couldn’t get all the tents in the picture. Picacho has a Ranger who posts info that may or may not be helpful. BJ did this trip once or twice, but said it was too cold. I suppose this sign doesn’t help my case although I was always comfortable in my sleeping bag. Just wished I’d packed the stocking cap that I’d laid out. We were treated to a beautiful sunset and then we tried to burn up all the fire wood that people brought along. I headed to my tent before that party ended. As soon as people started stirring on our last day, I started packing up and carrying my gear to the boat, once again choosing to paddle solo. I was rewarded with a great blue heron in the golden light of sunrise. A couple hours down river, I spotted a bald eagle in the same area that we’re spotted them before. He was king of the sandbar, keeping a few sea gulls well down to the other end. The trip ended at Fisher’s Landing on the Arizona side of the river, just in time to enjoy a hamburger at the cafe before heading up the road about 60 miles to Quartzsite. It was a wonderful trip! Quiet time on the river combined with good conversations in camp. Couldn't get better! A long time paddling friend puts together a lower Colorado River trip over MLK weekend every year. It’s a 35 mile section of river that I really enjoy, and we manage to stretch the trip out to three days on the river. The shuttle for the trip is miserable, to say the least – 95 miles – so I only do this trip when Helen’s organizing it. This time, no one chose to join me, so while there were nearly 30 people on the trip, I didn’t have anyone specifically with me, which allowed me to do what I most enjoy. I got up as soon as I heard others stirring at the Walter's Camp put-in. I got a picture of Helen’s dory as the sun was rising. It looked a bit naked without the trim colors that never cured correctly from the Grand Canyon trip removed and new colors not yet applied. I was on the river before 8 a.m. Arizona time traveling at my own pace, hoping to quietly watch the world wake up around me. Even the Boy Scouts that always do this section over MLK weekend were just carrying gear from their truck to the dock when I left Walter’s Camp. river started out glassy smooth, and the sun was warm enough to shed the wool shirt. Having the river to myself wasn’t enough to get this bald eagle to cooperate for me, taking flight just as I tried to get the picture. 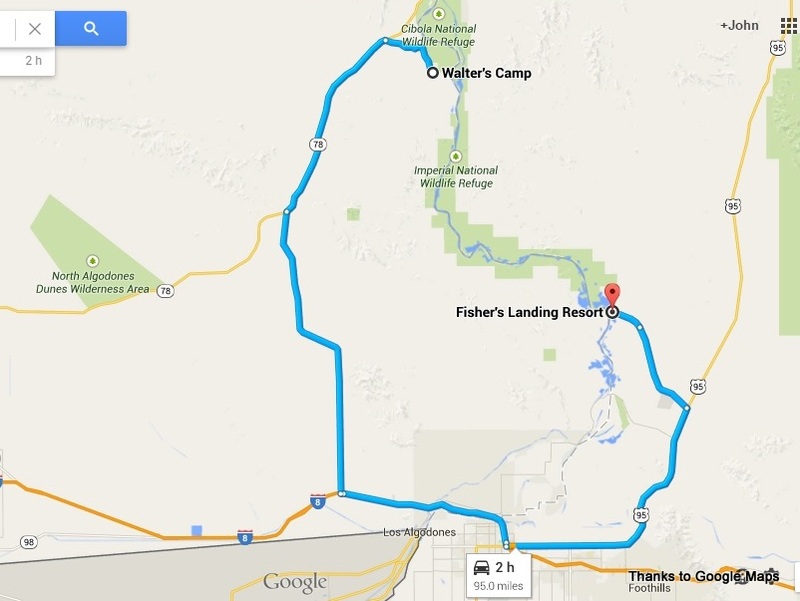 The Imperial Wildlife Refuge borders the river for much of the route, except the last couple miles and the section on river right where Picacho State Recreation Area is located. The mountains looked wonderful but I didn’t see many birds. After the first hour, there was just enough breeze blowing to hide the clues the river gives about where the channel lies, but it was a tailwind – a delightful trade off. although I was watched, perhaps closely, by one of the tethered blimps that are part of border security in this area. and the rest of Helen’s friends arrived. As has been the tradition for the past seven years, there was trash can turkey for dinner. In this case, we actually had two 14 lb. turkeys, plus packets of roasted veggies, green bean casserole in a dutch oven, mashed potatoes, fruit salad, and dutch oven apple cobbler for dessert. Not bad for the first day!